← Higgs-Boson: The Ultimate Linchpin? I love the color blue. I always have, even as a young girl. My room was mostly blue when I was growing up. This was unusual back in those days because blue was always considered masculine. Imagine my mother’s consternation when I insisted I wanted blue with navy accents. When she asked me for a second color, I agreed to have white. “Ayyah!” she must have muttered under her breath each time. In English, blue is just blue. But in other languages, there are many words to describe the nuances of blue. In Russian, for example, the different blues are distinct in their language and culture to the extent that each is a distinct color, as green and blue are two different colors in the English language. This is important because language shapes our thinking just as thinking shapes how we express ourselves. Historically, blue has been used by the religious, as in the veneration of the Blessed Virgin Mary or the mosaic glass windows of churches.It has been used on porcelain vases and other wares from China, England, France, the Netherlands, and Russia. In ancient times, blue was a difficult color to obtain, until it was mined as lapis lazuli from Afghanistan. Blue has been used in many expressions, as in the French expletive, “Sacre Bleu,” which has its origins in the reference to the “sacred blue,” a reference to Mary, the mother of Jesus. People say they are “blue” when they feel sad, despondent, melancholic. But in German, to say you’re blue (blau sein), you are drunk. 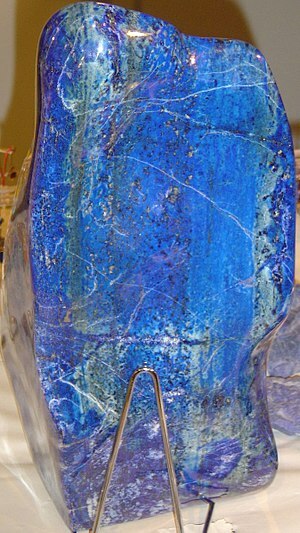 Lapis Lazuli – mined in Afghanistan for 3000 years. It was used in Egypt and all over the ancient world. Sapphire – rich blue. Did you know that the best sapphires are not the deep dark ones? The best ones are described as cornflower blue. In music, there is also much allusion to blue. There’s the Rhythm & Blues, the Blues, a Blue note (used in jazz when a piece is placed in a lower note for emphasis), or Bluegrass music (American country music), the British band Moody Blues. Through history, blue has been worn by soldiers, royal armies, and it is still used in business attire today. In sports, it is a favored color, as in many national flags. of voyages long perished from importance. I realize it was during the war and he longed for the green of freedom. And when you read the poem (written in 1939, by the way), it’s quite anguished and hopeful. I beg to differ about blue. For me, blue is a bright clear morning sky heralding the promise of a new day. Of countless possibilities. Of second chances. Of serendipity. Of something new and exciting. Blue is calm, quiet, with defenses lowered. There is a Tagalog expression, “malamig sa mata.” I guess the closest translation is that blue to me, is very cool or pleasant to the eyes. Blue brings the promise of pleasant times to come. I’m always reminded of an Irving Berlin song made famous by Ella Fitzgerald (1958) and more recently brought back to the airwaves by the late Eva Cassidy, “Blue Skies.” It’s such a great song. Prompts for the Promptless: LoveNotes (thequeencreative.wordpress.com) Rara has summoned us to this challenge! This entry was posted in Blue, Blue Skies, Colors, Happiness and tagged Blue, Blue Skies, Colors, Eva Cassidy, Irving Berlin, Lapis Lazuli, Nick Joaquin. Bookmark the permalink. Good piece about blue.Thank you. I enjoyed it. Reading this post has made me feel… not blue! Great write and interesting read. Thanks. I can’t say enough about blue! Lovely photos to illustrate your words, too. Thank you for an informative and fun post about blue. So much I didn’t know about the colour. Blue is indeed quite a colour. I love blue too. A lot of the things that inspires me has something to do with with this serene and fun color. 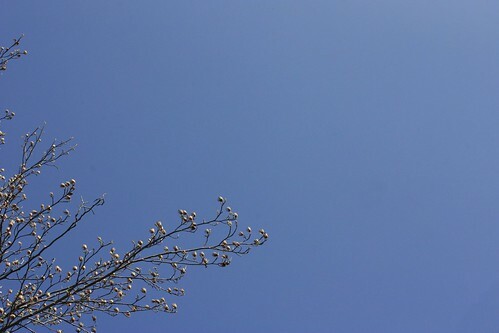 Seeing a blue sky is like having an assurance that everything will be alright. Beautiful images. Thanks. I meant , something to do with blue, a serene and fun color. What an interesting post! Ella did a fine job on that tune…and the color made another hit the following year when Miles Davis released his famous record: Kind Of Blue. I looked it up, John. 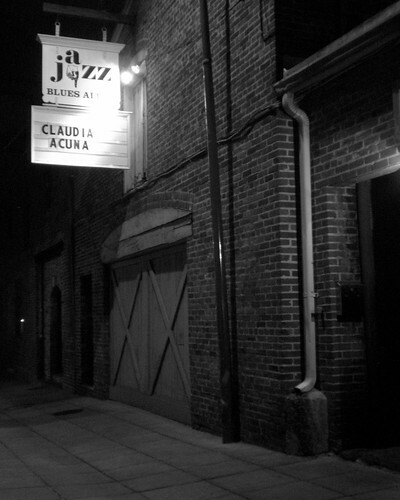 It’s a classic and supposed to be an all-time most influential jazz album. “Blue in Green” is a great listen. yes; I’ve been listening to it for about thirty years! sample “All Blues” as well—an awesome ballad. Thanks for including Event Pros LA in your blog! How can I possibly have forgotten, Gilly! Yves St. Laurent’s iconic home in Marrakech! Of course!